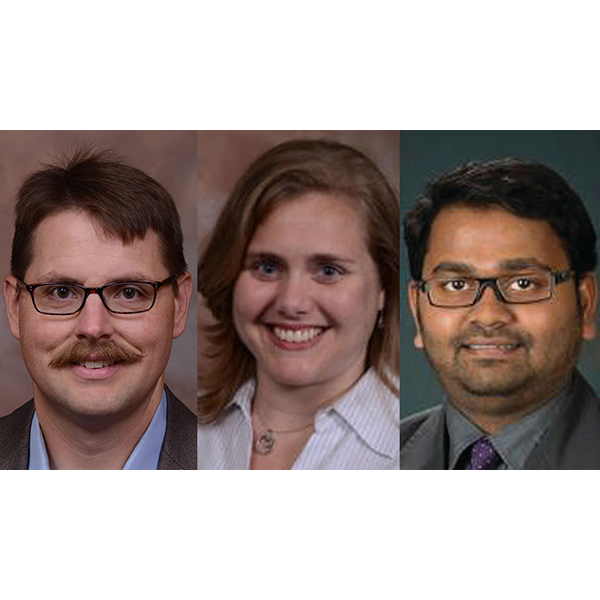 Three faculty from the Department of Biological Systems Engineering -- (from left) John Hay, extension educator; Nicole Iverson assistant professor; and Santosh Pitla, assistant professor -- will be given awards on Friday, March 2 at the Holling Family Award Program for Teaching Excellence. Three faculty members from the Department of Biological Systems Engineering -- John Hay, Nicole Iverson and Santosh Pitla -- will be given awards Friday, March 2 at the Holling Family Award Program for Teaching Excellence. The event will be from noon-1:30 p.m. at the Nebraska East Union. It is open to all faculty, staff and students. RSVP at https://go.unl.edu/jf60. Hay, an extension educator will be one of three University of Nebraska-Lincoln faculty to receive Senior Faculty Teaching Excellence Awards. Iverson and Pitla, each assistant professors, will be among four university faculty to receive Junior Faculty Teaching Awards.